Can Historical Newspapers Help Me Determine My Freedman Ancestors? You must do the necessary research to reach back to the pre-1870’s. You must research each person you find to get to know them and find the link back. You must look at whatever types of records exist for each person. In this case, we could not have gone back without newspapers. 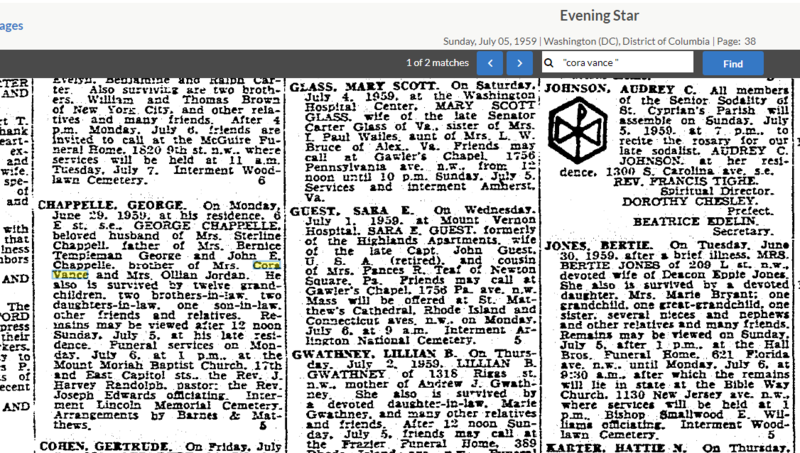 Select the historical newspapers that were generated in the area your ancestor lived. There are many different companies. Which one has the issues published in your ancestor’s area? See United States Newspapers. 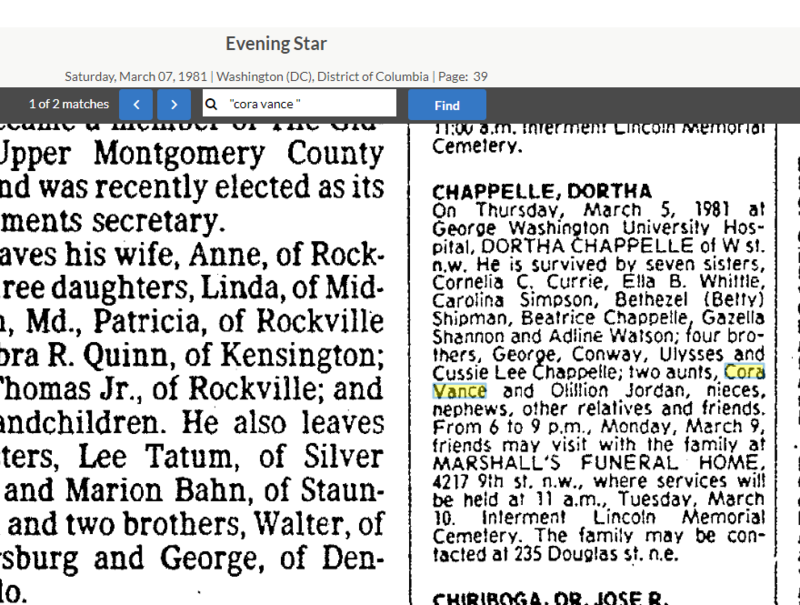 Next, I had researched Andrew Lykes Vance’s side, but next I need to search Cora Lee Chappelle Vance’s side of the family. When Dominique DeLorenzo posted about Chappelle’s, I remembered the problem I wanted to solve in researching Cora’s line. At the same time, Jan Mitchell-McDermott, from the group, began sending me a wealth of records identifying Cora’s line and her marriage to Andrew. It took 3 hours before she was finished. I had not ever seen a photo, so I was overjoyed. In the short paragraph, I got an address, where Andrew and Cora retired from, as well as their descendants. It is important to start from the beginning when you trace back so you are sure about who you are researching when you get back to the pre-1870’s. 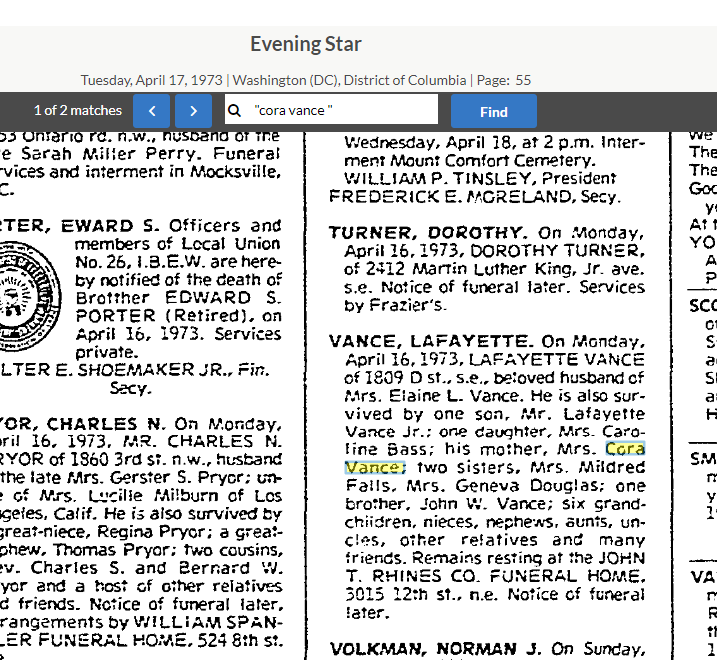 This obituary for Andrew Lykes Vance which names his wife and children helps me to know I have the right family. The strongest proof is Mrs. Geneva Douglas. 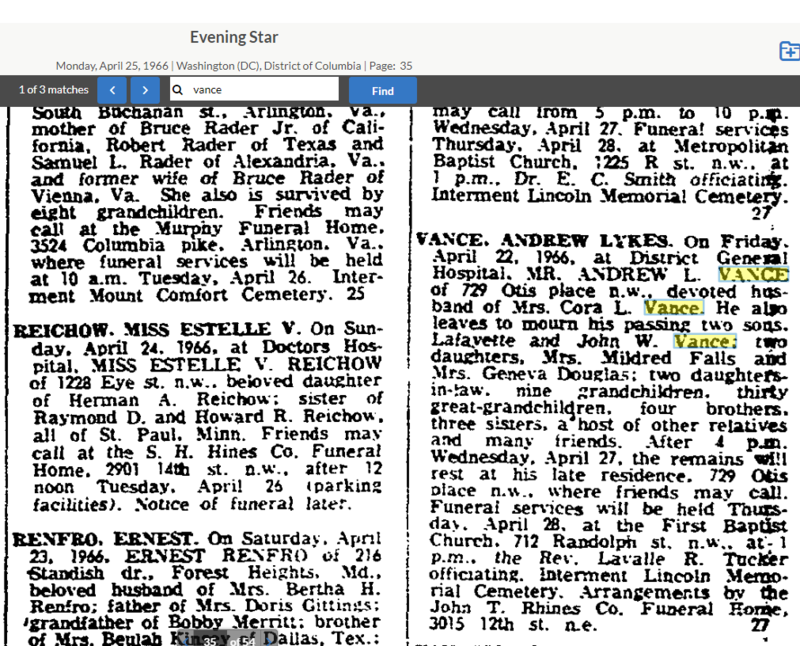 She was the daughter, Geneva Beatrice Vance born in 1922. This son of Mrs. Cora Vance and the late Andrew Lykes Vance, Lafayette Vance, also helps me to know I have the right person, Cora Chappelle Vance. We are going to trace her, but we need to make sure we do not ignore these important clues. These newspapers give us an idea of who makes up the family in the later years after the 1940 Census. 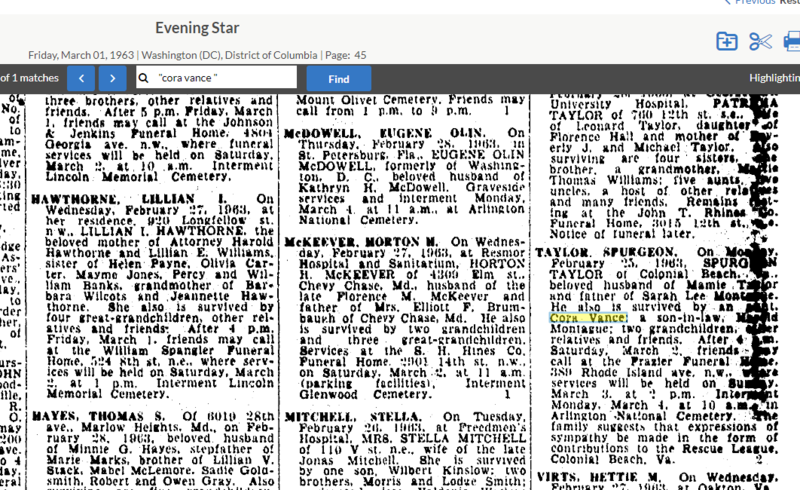 In DC in 1939, George Chappelle died. This was the brother of Cora Vance. 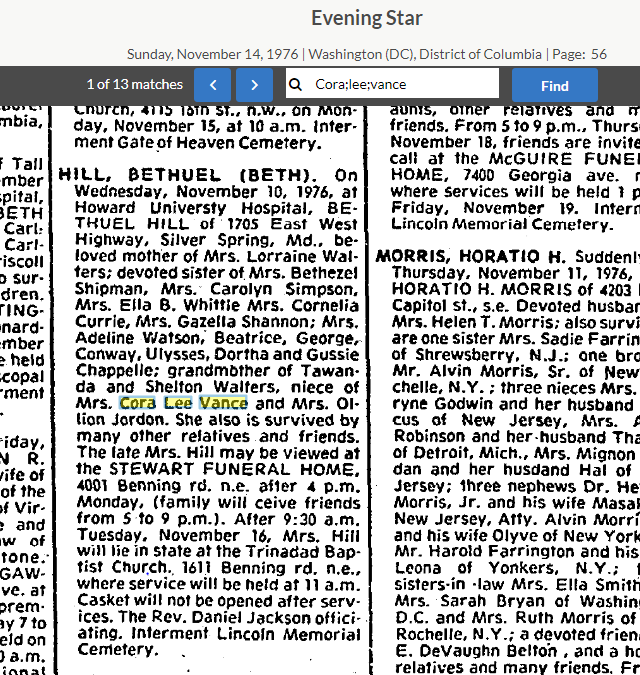 In 1976 in DC, Bethel Hill dies. 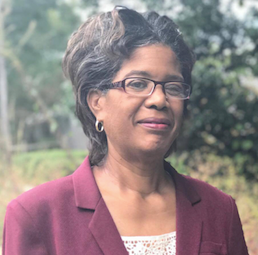 She is also tied to Mrs. Cora Lee Vance. She is her niece. 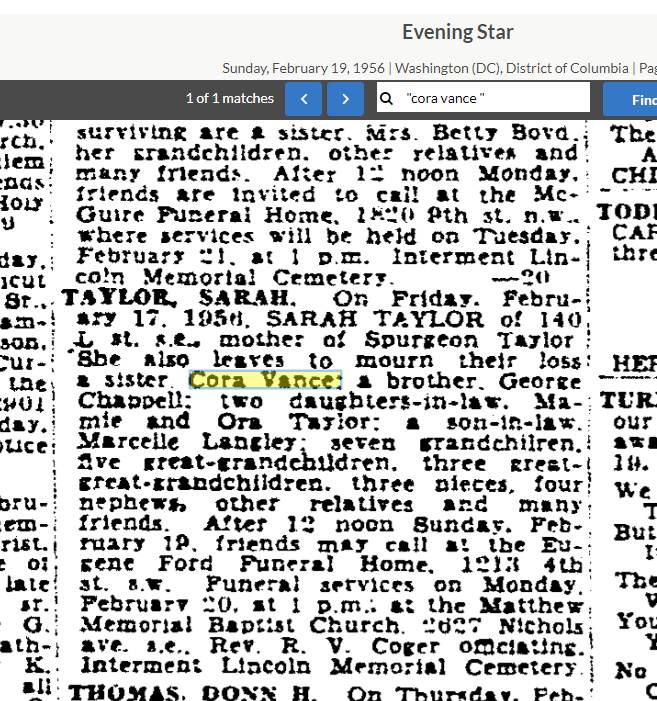 On February 17, 1956, Sarah Taylor leaves to mourn her loss a sister, Cora Vance and a brother George Chappelle. So now we can search for a brother which makes life easier. Spurgeon Taylor was a nephew to Cora Vance. Sarah and Cora were sisters. Cora Vance and Olillion (sp) Jordan are the aunts to Dortha Chappelle. They were living in Washington, DC. In 1930, they are shown as living in Washington, DC. Ancestry.com. 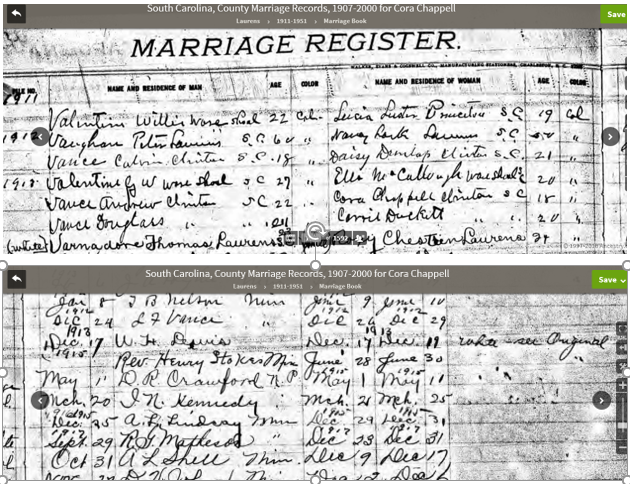 South Carolina, County Marriage Records, 1907-2000 [database on-line]. Lehi, UT, USA: Ancestry.com Operations, Inc., 2017. 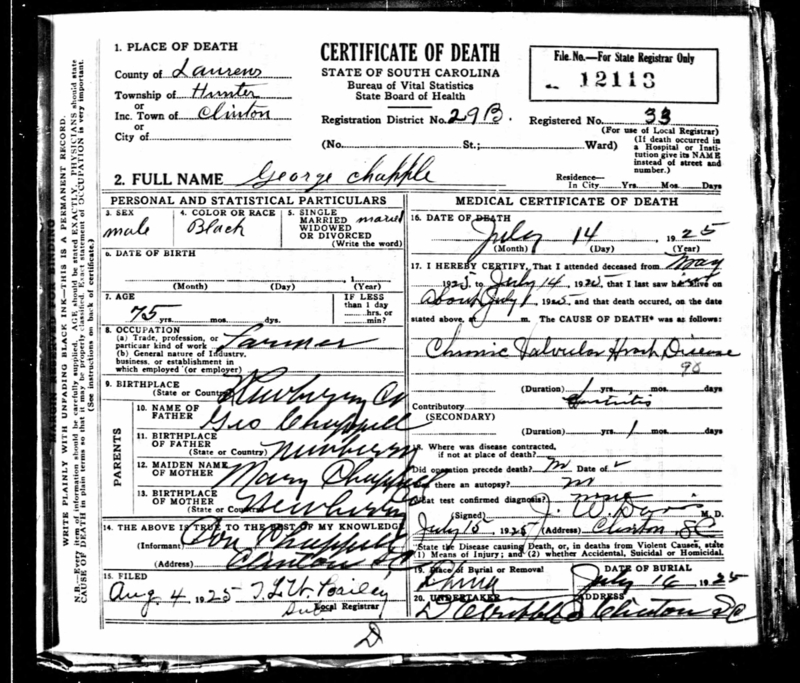 From George Chappelle’s death certificate, we get clues for the names of his parents, George Chappelle and Mary Chappelle. 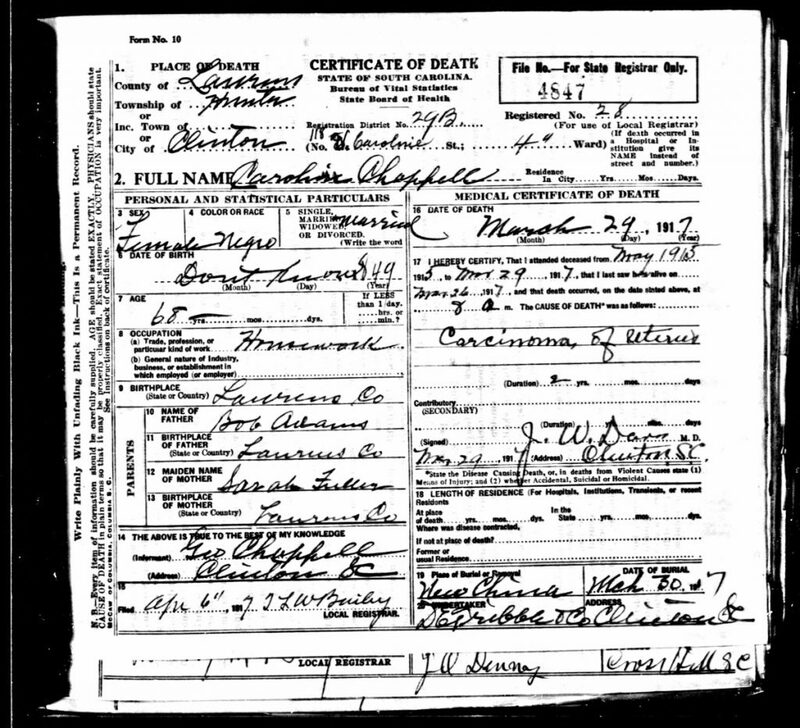 From Caroline’s death certificate we get clues for her parents, Bob Adams and Sarah Fuller. Ancestry.com. South Carolina, Death Records, 1821-1965 [database on-line]. Provo, UT, USA: Ancestry.com Operations Inc, 2008. Can you pick someone on your tree to research back to the 1870’s? Let us know who you pick in the Facebook Group. Do not forget to use newspapers to get back to the 1940 Census. 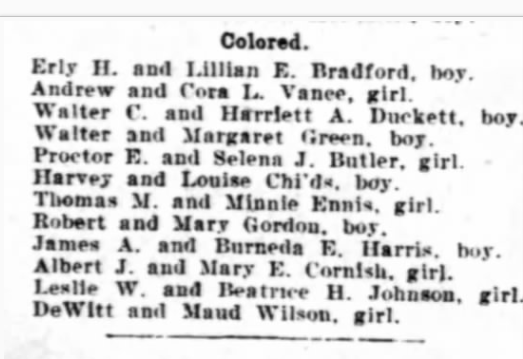 Next week, we will try to discover who among the ancestors of Cora is among the pre-1870 records.